DENVER, Colorado-NASA's next mission to the red planet-the Phoenix Mars Lander-is a true wedding of technology with planetary exploration: Something old, something new...something borrowed and something blue. Named after the resilient mythological bird, Phoenix is based upon a lander that was meant to fly in 2001, but administratively mothballed by NASA. It is also outfitted with instruments that are improved variations of gear carried onboard the ill-fated Mars Polar Lander. That vehicle went astray on touchdown nearly seven years ago, a breakdown of managerial and engineering matters-sadly setting off blues for a red planet. Today, the flight of the Phoenix is a different story. Here at Lockheed Martin Space Systems-the primary industrial partner for the mission-Phoenix is receiving a lot of extra special, tender loving care. An extensive, step-by-step shakeout of the spacecraft is underway prior to its launch in August of next year. The spacecraft team is resolute in getting the unique lander safely down in May 2008 to carry out a suite of scientific chores at the icy soils near the north polar permanent ice cap of Mars. Phoenix is the first lander ever to furrow into the martian polar surface. Using a lengthy and beefy robotic arm, this probe is stalking subsurface water ice, along with clues to climate change on the planet and a look for cozy nooks that might support life. The $386 million Phoenix Mission is the first mission in NASA's "Scout" program, said Edward Sedivy, Lockheed Martin Program Manager for the Phoenix Flight System. Mars Scouts are competitively proposed missions intended to supplement-at relatively low cost-the core missions of NASA's Mars Exploration Program. "When we started Phoenix, I don't think anybody fully appreciated how much effort was required to really penetrate the designs that we inherited in 2001 and we're bringing forward in Phoenix," Sedivy told SPACE.com. "Adapting a set of designs that were put in place for the 2001 launch opportunity to the 2007 launch opportunity for Phoenix has been a real challenge," he said. While spacecraft engineers took advantage of the heritage of the 2001 lander, Sedivy explained, they also mapped out changes due to today's risk paradigm of building and flying a Mars-bound craft the caliber of Phoenix. "So that's been really walking the tightrope," Sedivy observed. All is on track for Phoenix to be shipped in mid-May to Florida for its liftoff to Mars in August 2007. At Mars, Phoenix uses no airbags to cushion its landing. Rather, it is designed to ease-on-down to a Mars touchdown using sets of onboard thrusters [image]. "We have not done a controlled descent soft lander that succeeded since the Viking days in 1976," Sedivy pointed out. The last try at doing so was the botched Mars Polar Lander, lost on landing back in early December 1999...and built by Lockheed Martin. An investigation into that mishap at Mars reported in March 2000 that the most probable cause of the failure was the generation of spurious signals when the Mars Polar Lander (MPL) legs were deployed during descent. 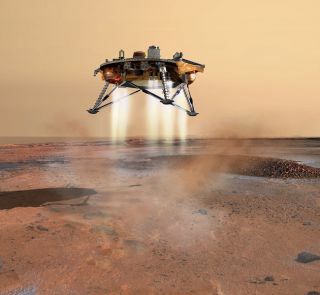 Those spurious signals gave a false indication that the spacecraft had landed, resulting in a premature shutdown of the engines and the destruction of the lander when it tumbled onto Mars. The same day that the MPL failure report was issued, NASA also announced the cancellation of the planned, but MPL-like, Mars 2001 lander. When the termination was announced, the 2001 lander hardware was placed in full planetary protection protocol, said Matthew Cox, Lockheed Martin Space Systems manager for Assembly, Test, and Launch Operations for Phoenix. "We treated it like it was going to Mars ever since the day that we had to stop work on it in 2000," he told SPACE.com. To resurrect the stored lander for Phoenix meant a reversal of normal engineering practice, Cox said. "We actually had to start with a disassembly process," noting that most programs build up a spacecraft piece by piece, not tear it down to the bare essentials. Being paid added attention by mission engineers are the descent rocket engines on Phoenix-twelve in number that are clustered in three locations that rapid fire with different lengths of pulses. They must perform over the last 35 seconds, right after parachute release, allowing the craft to slow itself down for a soft landing on martian real estate. A special Phoenix hot-fire test program was set up at Lockheed Martin Space Systems. Those trial runs stressed the propulsion system giving engineers vital insight about the structural and operational integrity of the Phoenix spacecraft. Cox said that the lengthy test activity-with valves opening and closing, hydrazine fuel coursing through spacecraft plumbing under high pressure, along with the chatter and vibration created by thrusting rocket engines-has bolstered confidence that the motors for controlled descent of Phoenix can function as billed. The hot-firings of the Phoenix terminal descent propulsion system proved highly beneficial, Sedivy added, to "learn what we needed to learn." The tests helped tackle and mitigate a top risk in reaching Mars safe and sound. Indeed, gently setting Phoenix down on Mars is tricky. There are lots of onboard real-time thinking needed during entry, descent and landing, such as: Handling winds when on main parachute, turning on broad-beam radar hardware, warming up engines and aligning center of mass with a velocity vector. Phoenix must then make a gravity turn for pointing outstretched legs toward Mars...while sensing where the Sun is for proper orientation of solar arrays when unfurled on the planet. The hydrazine-fed engines on Phoenix are turned off when sensors located on the footpads of the lander detect touchdown. Phoenix as well as controllers back on Earth will literally wait for the dust to settle-for as much as a half-hour-likely kicked up into the thin Mars atmosphere by the pulsing descent engines. Sedivy said the lander will fan out its dual solar arrays to produce power. Also, Phoenix uplinks its health status to a Mars orbiter flying over the landing zone-the Mars Reconnaissance Orbiter or the Mars Odyssey, then hunker down for the first night. "Surviving that first night is what we need to be focused on," Sedivy added. "If we can, we'd like to get a panoramic image [of the landing area] the first day." Phoenix is hurled toward Mars via a Delta 2 booster from Cape Canaveral Air Force Station in Florida. At the moment, the precise arctic landing spot on Mars where the craft will plant its legs is still being pondered. "Finding a benign landing site that is relatively free of rock hazards would be a beautiful thing," Sedivy pointed out. There's a modest-14 inches (35 centimeters)-of clearance to the base of the lander. But early camera sweeps by NASA's Mars Reconnaissance Orbiter (MRO) of possible Phoenix landing zones have produced some nail-biting within the community of mission engineers and scientists. MRO's High Resolution Imaging Science Experiment (HiRISE) can produce "ground truth" images showing boulders down to about 20-inches (0.5 meters) across. That sharp-shooting skill by MRO has already yielded unnerving truth, explained Peter Smith of the University of Arizona's Lunar and Planetary Laboratory in Tucson. He is Principal Investigator and Project Leader of the Phoenix Mission. HiRISE imagery near a Phoenix landing area under consideration revealed small ridges on either side of troughs. Small rocks and occasional larger boulders could also be seen, with some rocks protruding above the surface terrain casting shadows. Additional imagery of prospective Phoenix touchdown zones will help select the true landing site. "So far many of the images have small patches of boulder fields with boulders large enough and dense enough to be very worrisome," Smith told SPACE.com via email. "We are currently searching for safe landing sites and have no reason to believe that we won't find them," he added. Sedivy said that portions of the baseline landing site for Phoenix are clearly rockier than anybody was anticipating. But he concluded: "The good news is that there is a lot of acreage that's scientifically acceptable for the Phoenix objectives. So that's a good thing."